While filming Kimchi Chronicles, we visited a slew of amazing restaurants and consequently, many delicious meals were eaten. From seven minute jjigae at Sehmaeul Shikdang to piping hot street food at Korea’s many outdoor markets, eating in Korea was full of great experiences, but one takes the cake. When it comes to best restaurant in Korea, Marja and the crew all agreed that Doore was their top pick. 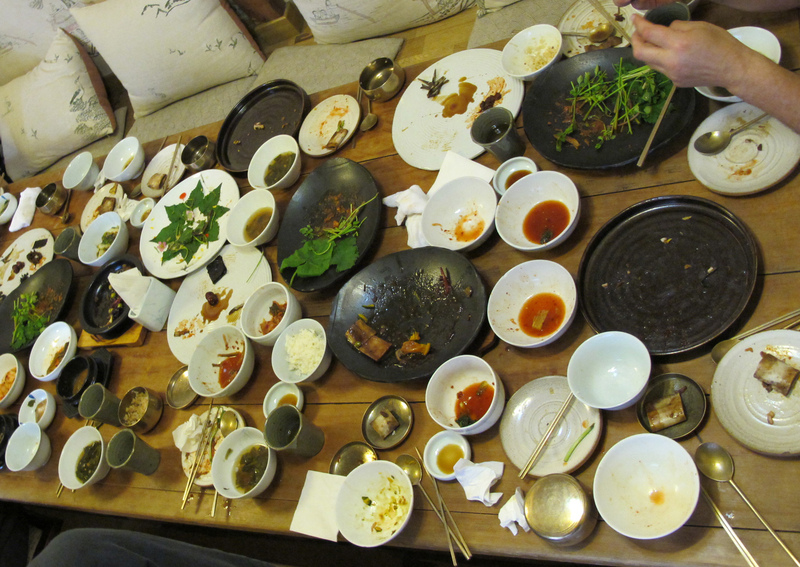 After a long shoot, the cast and crew were treated to a memorable lunch at Doore, a traditional Korean restaurant in Seoul’s Insadong area. It’s been serving up classic Korean fare for over half a century and located in a hanok style house, it makes for a very authentic dining experience. The menu at Doore is carefully curated, with dishes chosen daily based on seasons and availability of fresh ingredients. The lunch eaten there is the stuff of dreams. Bowls of different kinds of kinds of kimchi, from fresh spring greens to even year-old kimchi, were served alongside a plate of chili-spiced pork wrapped in mountain herbs. Then, there was a whole cooked pumpkin filled to the brim with braised short ribs, chestnuts, walnuts, and gingko. Following this tasty dish were a selection of soups made from fermented bean paste which they make themselves, and a simple clear soup reported to be excellent for digestion.